The commuting times are in full force and, as one who has never commuted by train on a daily basis before, I’ve discovered a bit of a learning curve with regards to the correct balance of needs and wants in my bag. I started my commuting days with my Longchamp Le Pliage bag, but I’ve lately found this iconic bag to represent young, more unprofessional, types (sorry if you disagree). It is certainly a lovely weekend or shopping bag, but entering the higher end of the business world in the intimidating realm of downtown Toronto, I thought I should upgrade to a good-sized leather bag for my daily business needs. 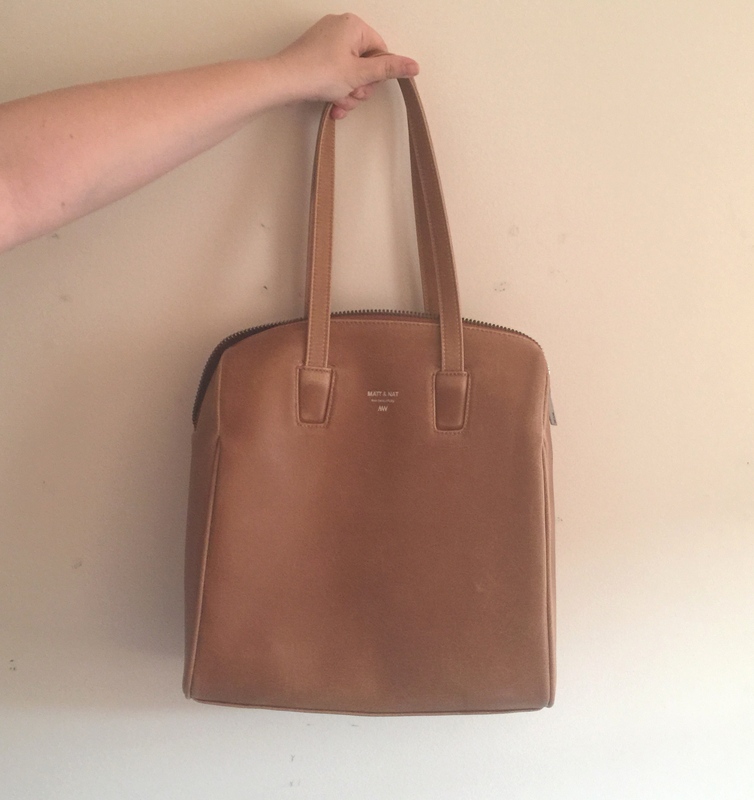 Last weekend, on a shopping spree to the Niagara Outlets, I found this amazing Matt and Nat Mitsuko Tote in a beautiful distressed camel leather. It’s the prefect size: big enough for a laptop and some documents, as well as small enough for an easy-to-carry over-sized purse. 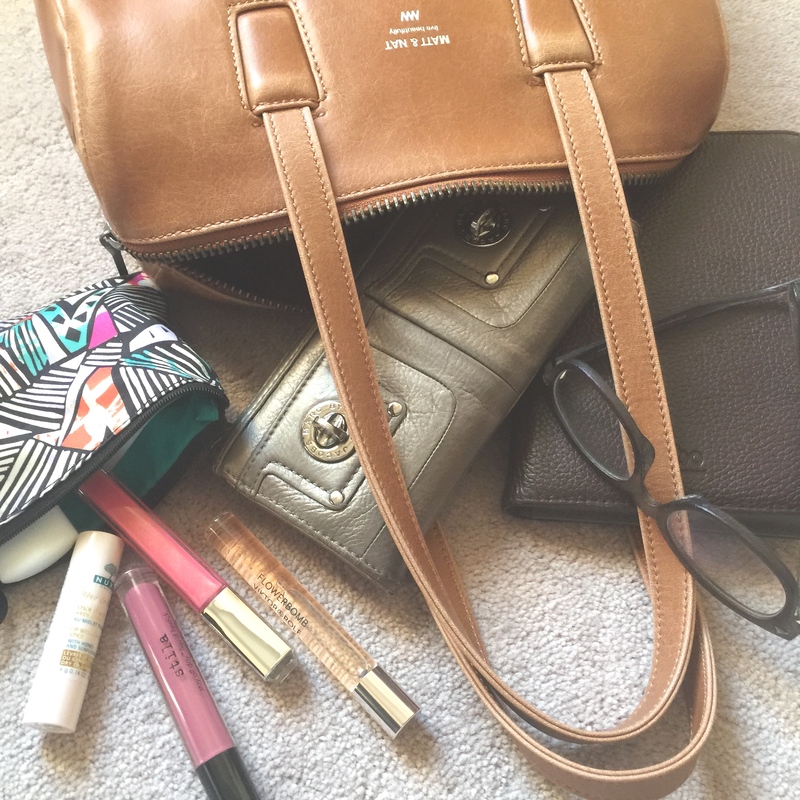 These are the items I’ve settled on as ‘must-haves’ for my daily commuting bag. I’m sure this is subject to change, and quite soon. First, and most important, is my Kobo Touch for the long commute along with a pair of glasses (I’m re-reading all Harry Potter’s right now – yes, I know I’m cool). Of course the bag is perfect size for an over-sized purse, so no need to carry a purse as well. So I’ve got my Marc by Marc Jacobs Wallet in there as well. I’ve had this wallet longer than any purse I’ve ever owned. Shocked I’ve stuck with the same one for so long. Then the important lip products for the day nicely tucked into a little H&M Pouch. I’ve narrowed it down to three important ones. A moisturizing lip balm (Nuxe Reve de Miel), a light coloured gloss (Revlon Ultra HD Lip Lacquer in Petalite) and my favourite daily lip stain (Stila Stay All Day Liquid Lipstick in Patina). And of course….the trip can get a little sweaty. Have to make sure I smell good with the Viktor and Rolf Flowerbomb Rollerball perfume. These have been getting me through the day (as well as a constant attachment to my iPhone), and, as I said, it’s sure to change constantly. I shove a few important work things in there as well, sometimes my laptop but usually just papers, papers, papers. What do you carry with you to work? Anything important you think I’m missing? I totally agree with the statement about the Longchamp Le Pliage bag. When you start to work in very professional setting you realize how important everything you carry really is, and how your viewed by your peers. Love the new bag! It seems like the perfect commuter bag with the right amount of room for everything.